It was all confusion on Saturday. We got out of our runs for a cuddle as usual, and then we had a run on the floor. And Saturday is when Mummy weighs us and does our nails if we need them, and checks our teeth and so on, and after that she makes our runs all fresh with clean fleece and everything. And then we go back for breakfast. On Saturday she took AGES. 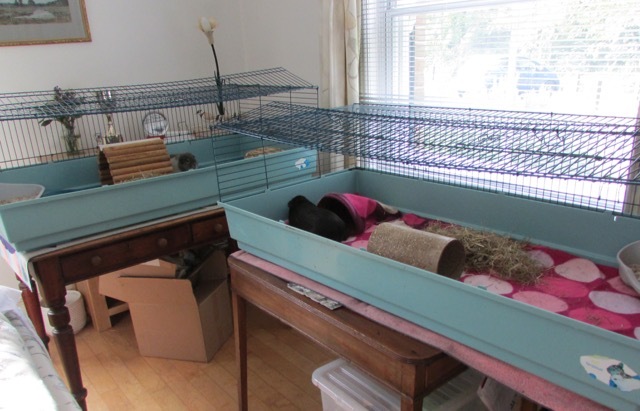 And she kept getting in our way, because she cleaned out the cages like normal, but then she took the tops off the cages and folded them up in the hallway, and then she took our cage bases up and took them out through the hall, and then she moved our table! Well! We were running around like mad, in fact we decided to hide from her in the boxes at the other end of the kitchen, because you never know what Mummy’s going to do next when she does things differently. At least we didn’t have to get in our carry boxes and go to the vet or anything. Anyway, we went back to our usual places when she got on with something in our cuddling room, and then Midge came down for his cuddle as usual, and Mummy picked up Oscar as usual and walked out of the kitchen with him! Oh, no, where has she taken him? I thought, and I wheeked like mad to tell her she was doing everything wrong. 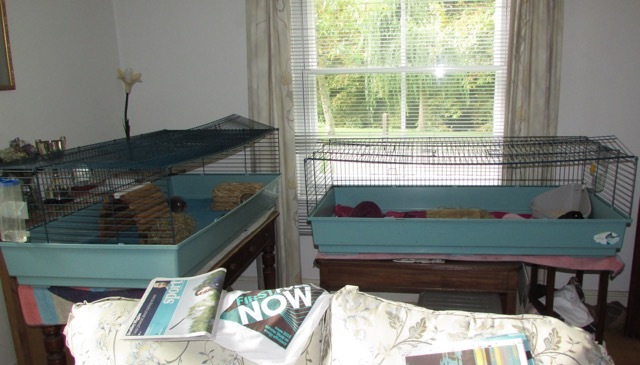 But after Kevin had his check up and cuddle and extras (he gets extras ‘cos he’s an old man), she picked me up and took me back to the cuddle room, and my cage was there, all ready for me! It’s pretty good, really, because Mummy comes and sits with us in the afternoons when it starts to get dark, before she goes back to work upstairs. She told us we have to be out of the way before the builders arrive, and when they do there’ll be all sorts of funny noises that they make in the kitchen. I think it’s all related to the day it started raining in the kitchen. And apparently we’re going to have different colour walls when we go back sometime next week. Nothing’s happened to Kevin and Midge, they’re still upstairs in Mummy’s work room. They do lead boring lives, not like me and Oscar. So this is Percy, signing off for now from The Living Room (I’ve been watching something called The News). Don’t get addicted to the tv, Percy. It can be a real time waster! Glad to hear the move was a short one, and things will be right again as soon as the kitchen ceiling is fixed. The”news” will addle your brain so ignore it! Mummy’s always getting Ideas, isn’t she? It’s a concern. Percy do you like the fleece better than the paper chips and how often does mum change them. Do they have stuffing in them if you’d let us know ,thatspaoblo ,Pedro and skippy we sure appreciate it? I’ll ask Percy to talk about that next week, Carol.